Fine sword fitting, in Jade, Chinese, Ming Dynasty, 1368-1644 AD. Superb pendant finely decorated with chilons. Size: 4,5 cm. in diameter. Ex Egeskov Collection, Ex. Jan Novak Collection, Sweden, formerly sold by Victoria Lindström, Antiques dealer in Stockholm ca. 1955 to Novak. 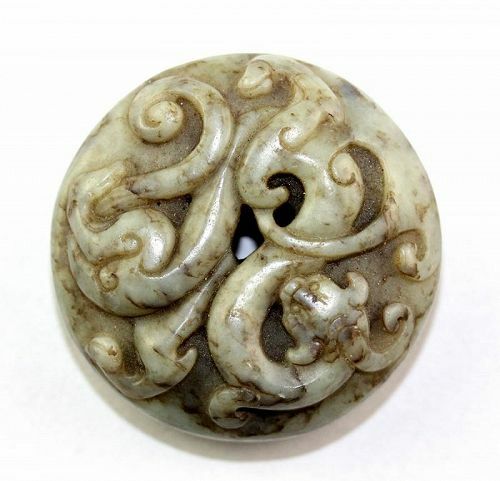 Exceptional Chinese Jade pendant of animal, Zhou Dynasty - Ex. Lee Anceint Chinese Han white Jade flycatcher pendant - ex. Novak coll. Important Chinese Late Han Dynasty Jade axe - ex Novak coll. 1950s!